The first US Navy Squadron to arrive in Brazil was VP-52. The flight Squadrons of the US Navy , until today are identified by an Alpha Numerical whose first symbol is the V letter followed by the Unit designator mission letter being the subsequent numeral the unit where the same is allotted. Soon, VP-52 was a Patrol Unit. 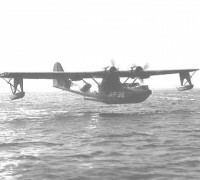 In Dec 11th 1941, 4 days after the Japanese attack on Pearl Harbor, 9 PBY-5 Catalinas and the Tender Clemson landed at the stream of Potengi river at Natal. From where they had a very first contact with the base they would operate in the years to come. It was only a detachment whose command headquarters had remained at Panamá. Later with the arrival at of Squadron VP-83 Parnamirim field, the huge airbase the Americans were building a few miles southwest of the ramp at the Potengi River, with the new amphibian Catalinas, the VP-52 made the trip back to the Canal Zone. With the Catalinas, VP-83, later re designated VB-107, with the powerful Liberators, remained in Natal from 07/04/42 until 08/Jan/45 and became the more effective Bombing/Patrol Unit of the US Navy in the World War Two, which was decorated with the, Presidential Unit Citation. In all, the Unit was directly responsible for the sinking of 06 German Uboats (and also took part in other 2 and one Italian submarine). During the period of operations in the South Atlantic, VP 83 lost 3 Liberators due to Anti Aircraft fire from the enemy (2 for submarines and 1 for a German blockade. Noteworthy the fact to be mentioned on the war against German u-boats in the south Atlantic, is that US Navy lost 44 crewmembers when engaging the enemy when operating from Brazilian bases. 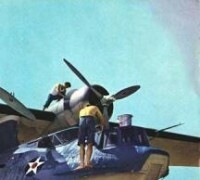 SQUADRON VB-129 - Based Natal/Recife/Salvador; 12 PV1; Jun 43 to Feb 44. 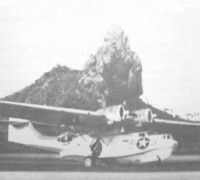 SQUADRON VB-130 – Based Fortaleza Pici; 12 PV1; Aug 43 to May 44. SQUADRON VB-143 - Based Recife/Salvador; 12 PV1; Aug 43 to May 44. SQUADRON VB-145 -Based Natal; 14 PV1; Sep 43 to Jan 45. SQUADRON VB-211- Based Galeão/Aratu/Natal; 12 PBM3; Sep 43 to May 45. 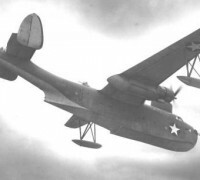 SQUADRON VP-45-Based Belém/Salvador; 15 PBY5; Apr 44 to May 45. SQUADRON VP-203 – Based Aratu/Galeão; 12 PBM3; Oct 43 to May 45. SQUADRON VB-134 – Based Recife/Natal; 14 PV1; Jan 44 to Mar 45. SQUADRON VPB-125 – Based Natal; 12 PV1; Feb 45 to Abr 45. SQUADRON VPB – 126 – Based Natal; 12 PV 1 Jan 45 to May 45. Joining U-164, followed U-507, sunk 13 Jan 43, only 30 miles distant from the first on position 01°38’S-039°52’W. On 15 Apr 43 it came the doomsday for Italian Archimede some 70 miles (position 03°23’S-030°28’W) off Fernando de Noronha.On 22 Jul 43, U-598 was attacked on position 04°05’S-033°23’W and submerged without being hit. In the following morning several aircrafts alternated in searching the area but the submarine was spotted only in the next day, 23 Jul. That was the first defeat of that Gallant Squadron and at the same times its first victory once the Squadron was receiving the new Naval Liberator aircraft which from then on would be the basic equipment of the newly created VB-107. This outstanding aircraft was fitted with radar and auxiliary tanks in the “bomb bay” which gave it greater endurance. Six external depth bombs were mounted externally at the wings. There is a picturesque note regarding the Catalina’s replacement by Liberator at the Army Air Force historical book at Parnamirim. At the arrival from the USA, already with their new aircrafts, the Squadron approached Natal amidst a bad weather. As the pilots had already been familiar with the area, they got their way to the runway at low level, clipping the tree tops, winding the river and the dusty road until they finally reached the threshold. After all planes landed “safely,” the Control tower operator who served the Army Air Force, phoned to the Naval Air Facility at the ramp of Potengi River asking if they were aware of a “bunch of white B-24 which were landing in mid of that downpour. In Aug 43, began one of the fiercest battles involving the German Uboats and the VB 107 aircrafts. On 06 Aug 43, Destroyer Moffet locates and attacks U-185 which upon the previous action on 03 Aug, had already sunk one British merchant, The lucky Uboat wriggled out again. On 11 Aug 43, day of the "rendezvous", B-1 of Cmdr Prueher shows up at the meeting off Ascension Island, but this time the fortunes turned back to him and the Liberator fails to return from this mission. Fate would be known 30 days later when survivors from U-185 sunk in the North Atlantic on 24 Aug clarified the matters: "U-604 transferred its fuel and provisions for U-185 under the supervision of U-172, when one white Liberator broke up from the clouds and dived on the sub. U-172 immediately crash dived. The first attack of B 1 failed and he circled for one more run. Although the Ventura crew after the attack deemed to have sunk the enemy, the same had been hit, but her ordeal had only commenced. Seriously damaged, having lost the First Officer, the boat radioed her base when received instructions from Adm. Döenitz which determined a rendezvous with U-172 and U-185 which would receive the crew following the scuttle of their vessel. Therefore the intense exchange of messages was intercepted by the Fourth Fleet Pina Radio Station at Recife which through radio goniometric crossings with Belém radio plotted the position of U-604. On 03 Aug 43, Liberator B-1 "Spirit of 83" under Lt. Cmdr. Bert Prueher located and attacked U-604 which once again although damaged managed to escape. A list with Uboats sunk by the VB-107 as follows:U-849 - 06°30’S-005°40’W on 25 Nov 43U-177 - 10°35’S-023°15’W on 06 Feb 44 U-863 - 10°45’S-025°30’W on 29 Sep 44 U-848 - 10°09’S-018°00’W on 05 Nov 43. Also Squadron VB 107 had counted one more loss when on 01 Jan 44, aircraft B-9 was downed by the A/A fire from blockade runner Weserland on position 09°00’S-023°45’W. That ship would be sunk on 03 Jan 44, by destroyer Somers which rescued her crew and landed them at Recife where they went through interrogation at Brazilian Army Derby headquarters. On Jan 45, VB-107 departed Natal headed for England, where ended the war as the most effective American Squadron which sank more Uboats 09. Their feats were recognized by Presidential Unit Citation.VP-83/VB-107 was only surpassed by RAF Squadrons 120 and 206 which operating from bases on the Bay of Biscay (where things were much more difficult for the U-boats which eventually crossed that dangerous area coaxing to their bases with heavy damage and in most cases with wounded crewmembers).